About an hour after Donald Trump was sworn in, I was having lunch with my wife and our five-month-old. As we picked at our food outside my office in D.C.’s Dupont Circle neighborhood, groups of tourists trickled by in Trump regalia. Early the next morning, as I dumped a pail of diapers in the trash can out front, I ran into a much different crowd: throngs of people wearing pink and carrying anti-Trump signs, passing through my neighborhood on their way to the Women’s March. It was scarcely 7am, yet already I’d seen more pink hats than I’d seen red ones the day before. Surprised — and still in my pajama pants — I scurried inside. DC’s Women’s March alone attracted three times as many visitors as Trump’s inauguration, crowd experts quoted by The New York Times estimate. 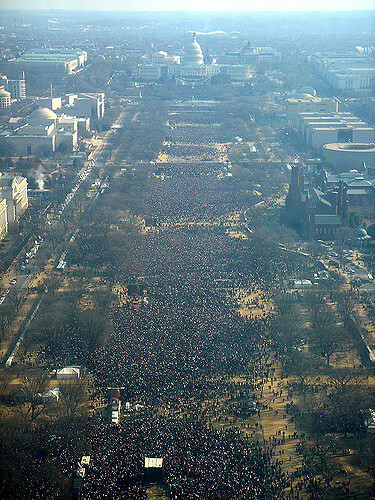 According to ridership data from the DC Metro system, only one other event topped it: Barack Obama’s inauguration in 2009. This was obvious to anyone who lives here, and to anyone who’s seen aerial photos of the crowd. Of course, whose crowd is bigger matters only a little more than whose hands are bigger, among other appendages Trump likes to size up. But sometimes he can’t help himself. At a moment you’d expect a new president to be busy with other things, Trump directed his press secretary to announce that his crowds had been “the largest audience to ever witness an inauguration, period.” Any media outlet that told you differently, he said, was lying. If that doesn’t set your Orwell alarm off, I don’t know what will. Yet almost immediately, Trump’s version of events started circulating through conservative news sites and social media outlets. The Trump administration, in short, used its inaugural press conference to tell bald-faced, easily falsifiable lies — and many Americans believed them. Aerial photos, crowd experts, Metro data, even TV ratings be damned — all that mattered were the “alternative facts” of the Trump team. There’s more at stake here than a “whose is bigger?” contest — including for millions of Trump supporters. To see how, let me tell you something else about Trump’s first day in office. Shortly after announcing that “every decision” will be “made to benefit American workers and American families,” Trump retreated to the Oval Office to sign his first directives as president. The first raised mortgage fees for working families, including many who probably supported Trump. Another began the process of dismantling a health care law that’s helped 20 million people get insurance. Trump voters in red states could be especially hard-hit. From Florida to Pennsylvania, in fact, over 6 million people getting health insurance subsidies live in states that Trump won. Combined with the law’s Medicaid expansion and protections for people with pre-existing conditions, that’s helped deep-red states like Kentucky and West Virginia cut their uninsured rates by half. But here’s the question: If Trump can tell you your own eyes are lying about a simple aerial photograph of his inauguration, can he also convince you your mortgage fees didn’t just go up? Or that you’ll still have health care after he axes your subsidy and gives your insurer permission to drop you? Talk about “alternative facts.” If those things slide, what else can he get away with? Trump voters are famously skeptical of Washington. Of all people, I hope they’d agree that watching what a politician does tells you more than hearing what he says. If they shut their eyes now, they’re going to get sucker punched. The post The Trouble with Trump’s ‘Alternative Facts’ appeared first on OtherWords.